This colourful vegetable and bean chilli will contribute to a fair few of your five-a-day as it’s packed with sweet peppers, courgette, tomatoes and kidney beans. 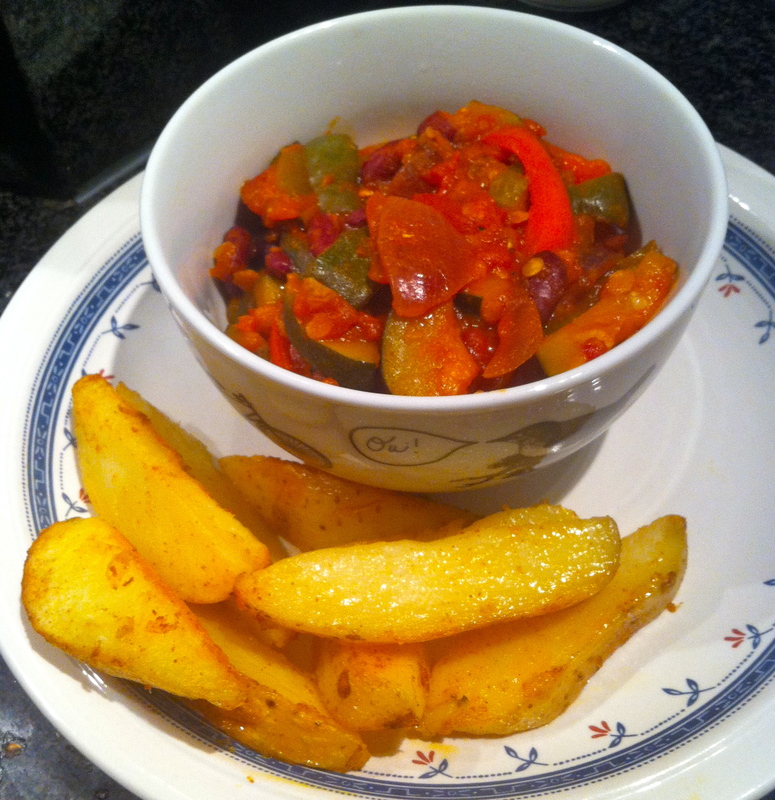 And the paprika potato wedges are comforting carbs to add a bit of naughtyness to make this a tasty and filling dish. 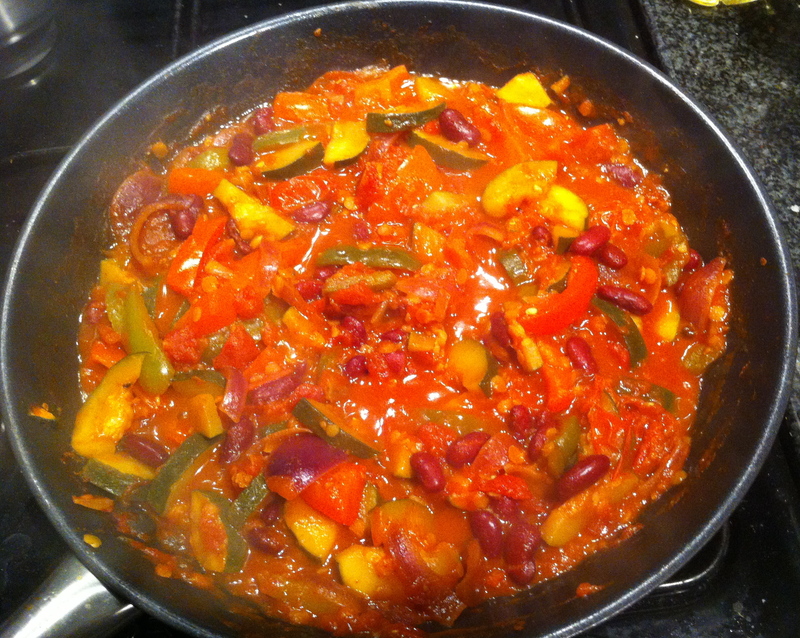 I often make vegetarian chilli with whatever vegetables are in the fridge. It’s a great way of using up veggies and makes a healthy dinner too. I experimented with adding marmite to this chilli as it’s something my dad often cooks with when making vegetarian bolognese and chilli for me. It brings an added depth to the sauce, along with the stock. 1. Bring a medium sized saucepan, half-full with water, to the boil and sprinkle in some salt. 2. Meanwhile, heat the olive oil in a large frying pan on a medium heat. Add the onion and fry for 3-5 minutes, stirring frequently. 3. Add the peppers and cook for five minutes, then stir in the courgette. Cook the vegetables for a further five minutes, and then add in the cherry tomatoes. Stir well. 4. While the vegetables are cooking, and when the water in the saucepan is boiling, drop in the slices of potato. Boil for 10 minutes. 5. Put the oven on to gas mark 7. Pour the sunflower oil into a medium sized baking dish and pop it in the oven to heat up. 6. After a few minutes, add the cumin and chilli and season well. 7. Pour in the chopped tomatoes and squeeze in the tomato puree. Turn up the heat and start bringing the mixture to the boil. 8. When the mixture is bubbling, pour in the stock and stir gently. Next, tip in the lentils, stirring continuously. 9. Simmer the chilli for 30 minutes, stirring occasionally. After 15 minutes, stir in the marmite. 10. When the chilli is on to simmer, check on the potatoes. Turn the heat down a bit and give a couple of the wedges a prod with a knife. When they are fairly soft, they’re ready. Drain them in a colander and give them a shake to get rid of any excess water. 11. Get the baking dish out of the oven and tip the potaotes into the dish, being careful that the oil doesn’t spray upwards. Cover the potatoes in the hot oil and sprinkle over the paprika. Make sure all of the wedges have some oil and paprika on them and that they’re evenly spread across the bottom of the dish, and put them in the oven for 30 minutes. 12. When the tomato sauce in the chilli has thickened and the lentils have expanded, the chilli is ready. 13. Serve the chill in bowls with the wedges on a plate beside them. Scatter some grated cheese on top of the chilli if you like (I would always encourage this), or leave off if you fancy a healthier option.